William “Billy” Mitchell was born to an affluent family in Nice, France in 1879. His grandfather, Alexander Mitchell, was one of the wealthiest men in Wisconsin and his father, John L. Mitchell, served in the U.S. House of Representatives and the Senate when Billy was in his teens. Prior to graduating from Columbia College of George Washington University he enlisted in an Army Infantry Regiment with the goal of fighting in the Spanish-American War. Billy’s father, fearing that service in the infantry could be hazardous, arranged to have Billy transferred to the Army Signal Corps where he quickly gained a commission (perhaps also due to the influence of his father). In 1913, at the age of 32 and with the rank of Captain, Billy Mitchell was appointed to the Army General Staff in Washington D.C. – the youngest officer ever assigned to that important post. His interest in aviation had not diminished, however, and when he was turned down for Army flight training because he was too old and held too high a rank (of Major at that time), he paid for his own flying lessons at the civilian Curtiss Aviation School at Newport News, Virginia. 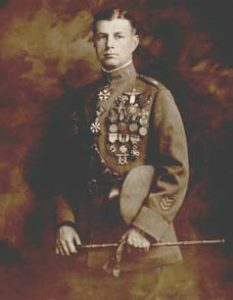 In time the Army’s aviation assets were assigned to the Signal Corps, and Mitchell, being the only Signal Corps member of the General Staff, was selected to head the Aviation Section of that organization. In July 1916 he was appointed Chief of Air Service of the First Army. In April 1917, when the United States declared war on Germany, Mitchell was traveling to France to observe the production of aircraft in England and France and the use of aircraft in the Great War. With America now in the war his mission suddenly changed to leading American air operations in that conflict. In the next few months Mitchell studied evolving aerial strategies and planned for the arrival of U.S. aviators. With his increased responsibilities Mitchell was promoted to the temporary rank of Colonel in August 1917. About a year later Mitchell planned and led an air and ground offensive that involved nearly 1500 British, French and Italian aircraft – at the time the largest coordinated air/ground attack in history. By the end of the World War I conflict Mitchell had been elevated to the temporary rank of Brigadier General. Mitchell remained in Europe after the Armistice to evaluate German aircraft technology and returned to the United States in January 1919 expecting to receive the post-war assignment of the Army’s Director of Air Service. However, when he arrived in Washington D.C., he found that Major General Charles Menoher, an infantryman who commanded the Rainbow Division, had been appointed to control the Army’s aviation assets. 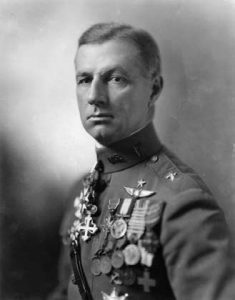 Mitchell, with limited authority in directing the course of Army aviation, would report to Menoher who had no knowledge and little interest in aviation. Nevertheless Mitchell remained an advocate of air power, to the dismay of Menoher, a strict disciplinarian, who was not able to stifle Mitchell’s outspokenness. In 1919 Secretary of the Navy, Franklin D. Roosevelt, held a meeting to discuss the future of Naval aviation and invited Mitchell (not Menoher) to represent the Army Air Service. Mitchell stressed the importance of air power and, without authorization, recommended the reorganization of the War Department and Navy Department to a Department of Defense consisting of a Navy, an Army and an Air Force. The Navy saw little use for aviation at that time and did not advocate a major investment in aviation. expand commercial aviation to provide a pool of trained pilots. In October 1919, in an attempt to convince his superiors that aircraft could cover large distances when needed for military action, Mitchell organized the “Transcontinental Reliability and Endurance Test” requiring round trip flights in Army DH-4 and other WWI aircraft. Forty eight aircraft were to fly from New York to San Francisco and back, and fifteen aircraft would fly from the West coast to the East coast and return. The “Great Air Race” of 1919, however, did little to support Mitchell’s objectives. Engine failures and weather problems plagued the event. Thirty-three aircraft (of the sixty-three that participated in the “race”) made a one-way crossing and only eight completed the round trip. Many crashes occurred, resulting in seven fatalities. Aviation detractors saw the test as proof that aviation was not reliable. Mitchell and his friend and World War I pilot Fiorello La Guardia claimed the test showed that aerial mobilization was feasible, but not with obsolete aircraft like the DH-4 “Flaming Coffin.” New, improved aircraft were needed. The Chicago Tribune reported the event as “Rank Stupidity”.